The pope, known as @pontifex, is the most influential world leader on Twitter. He has more than 23 million followers on nine different language accounts. He is involved in creating the messages, but doesn’t actually write them or tap the tweet button. However, Pope Francis signs off on every tweet. As the Pope visits the United States – Washington, D.C., New York City and Philadelphia – the Vatican hopes to inspire a younger generation, especially millennials. The pope’s team of digital professionals is using social media to spread his message of hope and inclusiveness to the younger audience. Aleteia USA, Sports Media Challenge, Swyft Media and Tracx are the social media-focused agencies and software providers behind the pope’s current campaign. It includes the hashtags #PopeisHope and #GoodisWinning, and “Popemojis” that you can download on your smartphone’s app store. 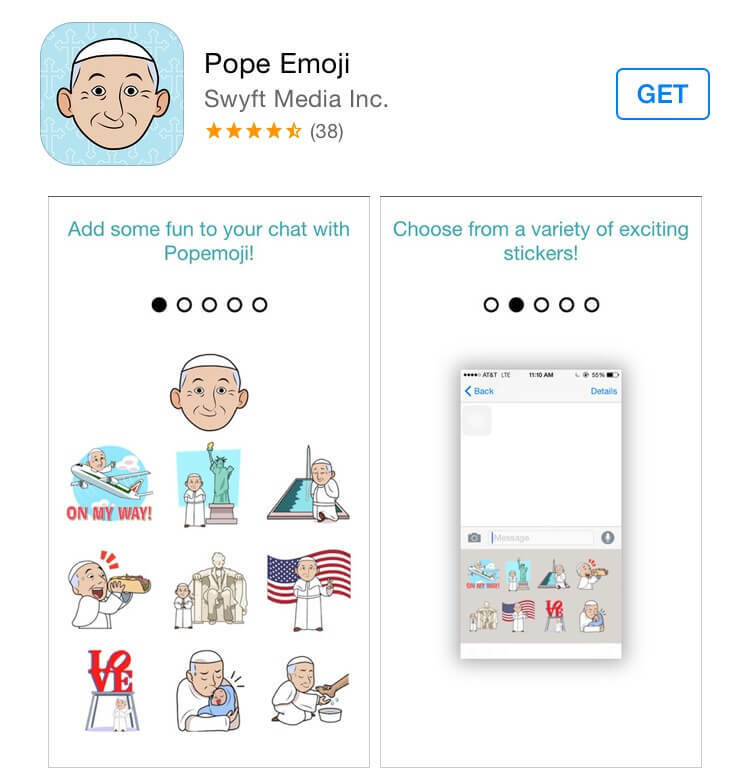 The Popemojis are cartoons that depict Pope Francis visiting famous attractions like the Liberty Bell, eating Philly cheesesteaks, crowdsurfing and taking selfies with fans. The campaign has recruited a “digital street team” of 60 digital strategists, content creators and community managers, 35 of whom will be publishing content during the Pope’s appearances in the U.S. this week. The rest of the team will work from the “Pope is Hope social listening center” in Philadelphia. Its multi-platform approach goes by the handle @PopeIsHope. This campaign goes beyond making noise on social media. By using Tracx software to analyze data, the digital team will be able to deliver insights to the Catholic Church so it can better understand the issues that matter to young people and how to engage with them. Although Francis has condemned social media, calling it “mental pollution,” he recognizes the importance of digital media. During his reign as pope, he has reorganized the church’s communications department to increase social and digital media efforts. By taking a digital approach to communication and creating this campaign, the Catholic Church hopes to build its brand and reconnect with people who have abandoned Catholicism. The church is moving away from the idea that contemporary media is a “source of contamination” and is instead embracing contemporary communication technology as a way of engaging with people of faith, even though there is still some concern about the commercialization of religion. While social media platforms continue to drive conversation, especially among millennials, the Catholic Church is using a digital strategy to meet people where they are: online. During the pope’s visit to the United States this week, his ultimate goal is to open people’s minds and hearts to drive them to act. Follow along with @Pontifex and @PopeIsHope this week to find out why #GoodIsWinning as Pope Francis visits the United States for the first time.